Remove stems, veins and most of the seeds of the bell and jalapeno peppers. Mince peppers in a food processor. In a 5-quart pot over high heat, combine bell peppers, jalapenos, sugar and vinegar. Bring to a rolling boil; boil for 3 minutes. Remove from heat and cool for 5 minutes. Stirring constantly, add the pectin and let mixture continue to cool for 2 minutes more. Now stir for 1 minute. Pour into hot, sterilized jars and top with sterilized lids. 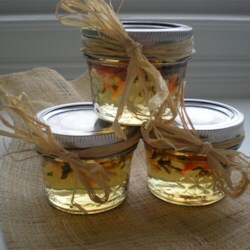 Secure lids with bands and allow jars to cool slowly, creating a vacuum seal.